Andrews, J.F. 1969, Dynamic model of the anaerobic digestion process, Am. Soc. Civil Eng. 95, 95-116. Attal, A.; Ehlinger, F.; Audic, J.M. ; Faup, G.M. 1988, pH-Inhibition mechanism of acetogenic, acetoclastic and hydro-genophilic populations, Proc. Int. Symp. Anaerobic Digestion, 5, 22-26. Balch, W.E. ; Fox, F.E. ; Magrum, L.J. ; Woese, C.R. ; Wolfe, R.S. 1979, Methanogens: reevaluation of an unique biological group, Microbiol. Rev. 43, 260-296. Bolle, W.L. ; Breugel, J.; Gils, W. 1986, Kinetics of anaerobic purification of industrial wastewater, Biotechnol. Bioeng. 28, 542-548. Boone, D.R. ; Bryant, M. 1980, Propionate degrading bacterium Synthrophobacter wolinii sp. nov. gen. nov. from methano-genic ecosystem, Appl. Environ. Microbiol. 40, 626-632. Brandis, A.; Thauer, R.K. 1981, Growth of Desulfovibrio species on hydrogen and sulfate as sole energy source, J. Gen. Microbiol. 126, 249-252. 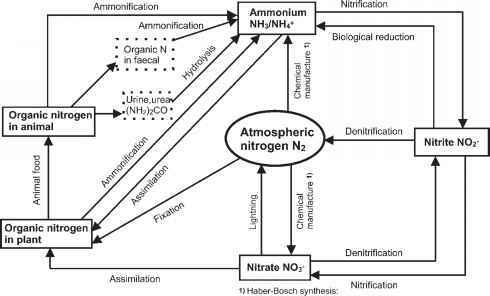 Breithaupt, T. 1997, Rotationsscheibenreaktor für die aerobe, anoxische und anaerobe Abwasserreinigung. Praktische Einsatzmöglichkeiten und mathematische Modellierung, VDI-Forschungsberichte, Reihe 15, 197. Konzentrationsprofile in Rotationsscheibenreaktoren und deren Modellierung am Beispiel des anaeroben Acetatabbaus mit experimenteller Überprüfung, Acta Hydrochem. Hydrobiol. 26, 288-295. Bryer, J.D. 1985, Structured modelling of the anaerobic digestion of biomass particulates, Biotechnol. Bioeng. 27, 638-649. Carr, A.D.; O'Donell, R.C. 1977, The dynamic behavior of an anaerobic digester, Prog. Water Technol. 9, 727-738. Chang, J. 1982, Studies On Methanogenic Phase In Anaerobic Digestion, PhD thesis, Tohoku University, Tohoku. Dauber, S. 1993, in: Anaerobtechnik, ed. B. Böhnke, W. Bischofsberger, S.F. Seyfried, Springer-Verlag, Berlin. Denac, M. 1986, Anaerober Abbau gelöster organischer Stoffe in Festbett- und Wirbelschichtreaktoren, PhD thesis, ETH Zurich. Fukuzaki, S.; Nishio, N.; Nagai, S. 1990, Kinetics of the methanogenic fermentation of acetate, Appl. Environ. Microbiol. 56, 3158-3163. Ghosh, S.; Pohland, F.G. 1974, Kinetics of substrate assimilation and product formation in anaerobic digestion, J. W.P.C.F. 46, 748-759. Gottschalk, G. 1986, Bacterial Metabolism, 2nd edn, Springer-Verlag, Berlin. Grady, C.P.L. Jr.; Daisser, G.T. ; Lin, H.C. 1999, Biological Wastewater Treatment, 2nd edn, Marcel Dekker, New York, p. 611. Graef, S.P. ; Andrews, J.F. 1973, Mathematical modelling and control of anaerobic digestion, AIChE Symp. Ser. 70, 101-131. Gujer, W.; Zehnder, A.J.B. 1983, Conversion processes in anaerobic digestion, Water Sci. Technol. 15, 127-167. Hall, E.R. 1992, Anaerobic treatment of wastewaters in suspended growth and fixed film processes, in: Design of Anaerobic Processes for the Treatment of Industrial and Municipal Wastes, ed. Malina, J.F. Jr.; Pohland, F.G., Technomics Publishing, Lancaster, Penn., p. 41-118. Hanaki, K.; Noike, T.; Matsumoto, J. 1985, Mathematical modelling of the anaerobic digestion process, in: Mathematical Models in Biological Waste Water Treatment, ed. Jörgensen, S.E. ; Gromiec, M.J., ElsevierVerlag, Berlin, p. 41-118. Harper, S.R. ; Pohland, F.G. 1986, Recent developments in hydrogen management during anaerobic biological wastewater treatment, Biotechnol. Bioeng. 27, 585-602. Jeris, J.S. ; McCarty, P.C. 1965, Biochemistry of methane fermentation using 14C tracers, J. W.P.C.F. 37, 178. Kus, F. 1993, Kinetik des anaeroben Abbaus von Essig- und Propionsäure in Bioreaktoren mit immobilisierten Bakterien, VDI-Forschungsberichte, Reihe 15, 115. Laquidara, M.J.; Blanc, F.C. ; O'Shaughnessy, J.C. 1986, Developtment of biofilm, operating characteristics and operational control in the anaerobic rotating biological contactor process, Water Pollut. Control Fed. 58, 107-114. Lawrence, A.W. ; McCarty, P.L. 1969, Kinetics of methane fermentation in anaerobic treatment, J. W.P.C.F. 41, 2. Lettinga, G.; Hulshoff, L.W. 1991, UASB process design for various types of wastewaters, Water Sci. Technol. 24, 87-108. Lettinga, G.; Hulshoff, L.W. 1992, UASB process design for various types of waste-waters, in: Design of Anaerobic Processes for the Treatment of Industrial and Municipal Wastes, ed. Malina, J.F. Jr.; Pohland, F.G., Technomics Publishing, Lancaster, Penn., p. 119-145. Massey, M.L. ; Pohland, F.G. 1978, Phase separation of anaerobic stabilization by kinetic controls, J. W.P.C.F. 50, 2204-2222. McInerney, M.J.; Bryant, M.P. 1981, Review of methane fermentation fundamentals, in: Fuel Gas Production from Biomass, ed. Wise, D.L., CRC Press, Boca Raton, p. 19-46. McInerney, M.J.; Bryant, M.P. ; Pfennig, N. 1979, Anaerobic bacterium that degrades fatty-acids in syntrophic association with methanogenes, Arch. Microbiol. 122, 129-135. Mosey, F.E. 1983, Mathematical modelling of the anaerobic digestion process: regulatory mechanisms for the formation of short chain volatile acids from glucose, Water Sci. Technol. 15, 209-232. Nethe-Jaenchen, R.; Thauer, R.K. 1984, Growth yields and saturation constant of Desulfovibrio vulgaris in chemostat culture, Arch. Microbiol. 137, 236-240. Pohland, F.G. 1992, Anaerobic treatment: fundamental concepts, applications, and new horizons, in: Design of Anaerobic Processes for the Treatment of Industrial and Municipal Wastes, ed. Malina, J.F. ; Pohland, F.G., CRC Press, London, p. 1-33. Seyfried, C.F. 1979, Reinigung organisch hochverschmutzter Abwässer mit dem anaeroben Belebungsverfahren am Beispiel von Abwässern aus der Nahrungsmittelherstellung, Veröffentlichung des Instituts für Siedlungswasserwirtschaft, Universität Hannover. Shea, T.G. ; Pretorius, W.A. ; Cole, R.D. ; Pearson, E.A. 1968, Kinetics of hydrogen assimilation in the methane fermentation, Water Res. 2, 833-848. Spieß, A. 1991, Anaerobe Abwasserreinigung in neuen Bioreaktoren mit Polyurethanpartikeln zur Immobilisierung der Bakterien, VDI-Forschungsberichte, Reihe 15, 85. Stronach, S.M. ; Rudd, T.; Lester, J.N. 1986, Anaerobic Digestion Processes in Industrial Wastewater Treatment, Springer-Verlag, Berlin, p. 32-33. Tait, S.J. ; Friedman, A.A. 1980, Anaerobic rotating biological contactor for carbenous wastewater, J. W.P.C.F. 52, 2256-2269. Ware, A.J. ; Pescod, M.B. 1989, Full-scale studies with an anaerobic/aerobic RBC unit treating brewery wastewater, Water Sci. Technol. 21, 197-208. Ware, A.J. ; Pescod, M.B. ; Storch, B. 1990, Evaluation of alternatives to conventional disc support media for rotating biological contactors, Water Sci. Technol. 22, 113-117. Weimer, P.J. ; Zeikus, J.G. 1978, Acetate metabolism in Methanosarcina barceri, Archiv. Microbiol. 119, 175-182. Widdel, F.; Pfennig, N. 1981, Studies on dissimilatory sulfate reducing bacteria that decompose fatty acids I. Isolation of new sulfate reducing bacteria enriched with acetate from saline environments. Description of Desulfobacterpostgatei gen. nov., sp. nov., Arch. Microbiol. 129, 395-400. Yoo, E.S. 2000, Biological and Chemical Mechanisms of Reductive Decolorization of Azo Dyes, PhD thesis, TU Berlin. Young, J.C. 1991, Factors effecting the design and performance of up flow anaerobic filters, Water Sci. Technol. 24, 133-156. Zehnder, A.J. 1988, Biology of Anaerobic Microorganisms, John Wiley & Sons, New York. Zehnder, A.J. ; Wuhrmann, K. 1977, Physiology of a Methanobacterium Strain AZ, Arch. Microbiol. 111, 119. Zehnder, A.J. ; Huser, B.A. ; Brock, T.D. ; Wuhrmann, K. 1980, Characterisation of an acetic-decaroxylation, non-hydrogen-oxidizing methane bacteria, Arch. Microbiol. 124, 1-11. Zeikus, J.G. 1979, Microbial populations in digesters, in: Proc. 1st Int. Symp. Anaerobic Digestion, Applied Science Publications, London.